Dow’s Global Water Technology Center in Tarragona, Spain. 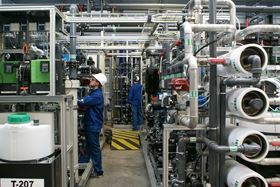 With global demand for water anticipated to exceed viable resources by 40% by 2030 Reverse osmosis (RO) membrane technology will play an increasingly critical role in helping the world produce more potable water, and helping operators and manufactures get the most use out of every drop. According to the United Nations global demand for water will exceed viable resources by 40% by 2030, so we must reduce consumption and recycle water where possible. Forty years ago, scientists at the North Star Research Institute founded FILMTEC Corporation and introduced thin-film FILMTEC™ RO membranes. The company was acquired by Dow Chemical Company in August 1984, forming Dow Water Solutions. Over the last four decades, advancements in science have enabled RO membranes to effectively remove and separate salt and other contaminants and impurities from water at the molecular level, helping turn seawater, low-quality wastewater and raw water into high-quality process water. Originally applied to desalinate seawater and brackish water, the use of RO membranes has expanded to include industrial, municipal, power generation, commercial, residential, oil and gas, food and beverage applications. RO innovations and efficiencies make the desalinization of seawater an increasingly viable means of meeting local water needs. For example, The Carlsbad Desalination Plant in California uses FilmTec RO Elements to help enable a locally-controlled, drought-proof supply of drinking water for nearly 112,000 households. Compared to the technology available 10 years ago, the plant requires 12% less energy and approximately 23% fewer membranes and pressure vessels to yield the same quality and quantity of water. As our understanding of water dynamics increase, so will the efficiency and practicality of RO. Because water infrastructure is essential to address long-term water scarcity challenges, Dow is focused on research to support an increased understanding of US waterways and watersheds. Ultimately, incentives for technology implementation and a supportive policy framework that lowers risk are needed for faster RO adoption and local, long-term water investment decision-making. Research and development is ongoing in the water space, and membrane technology will continue to evolve to help solve emerging water challenges. 4 Seen with the 30 million gallons per day (mgd) expansion in early 2015 and compared to the status quo performance of the existing membranes used in the original 70 mgd facility. HP Nanda is the Vice President and General Manager of Dow Water Solutions. In this role, he is responsible for all aspects of the business; formulating global business, technology and asset strategy; building organizational capability; managing strategic growth and innovation portfolio including in-organic growth options and profit/loss management to deliver business results.